I get super excited when Friday rolls around!!!!! Being a mom, that doesn't mean quite the same thing that it used to, but I still find myself counting the days until Friday of each week! 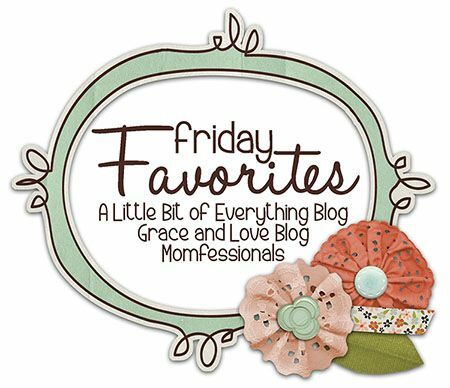 Today, I am linking up with A Little Bit of Everything, Grace and Love, and Momfessionals to share my Friday Favorites...I picked four favorites which are just a small handful of my favorites from the past week! I recently had to order my very favorite face lotion by Clinique as well as a Mustela Cold Cream Stick for the girls. So I figured while I did that, I might as well also order a new Eye Cream! And boy did this stuff not disappoint. It did what it promised to do...get rid of my puffy eyes (you know from that lack of sleep due to my ever growing baby bump). And guess what?!?! It worked the very first time I used it...no waiting 4-6 weeks or something that other creams promise to see results! I think I may have found a great go-to eye cream for everyday! Yesterday, I did some stress shopping and picked up some adorable matching skeleton PJs for the girls from The Children's Place! Oh yeah and they are HOT PINK which makes them even better! These pajamas will be washed and ready for wear beginning September 2nd (the day after Labor Day, which is when fall officially starts in the Hilosky House) and will get lots of use until Halloween! I can't even handle the cuteness! This was the perfect birthday gift from my Mother and Father In-Law! So far I have baked one amazing White Chocolate Funfetti Bundt Cake in this pan, and I am already dreaming about all of the yummy fall cakes I can make (can anyone say PUMPKIN)!!!! And of course this is my absolute favorite thing about this week! Lacie Jane is still talking about how much fun she had on her birthday, and I still cannot believe that she is three already! I feel like it was just yesterday that I was anxiously awaiting her arrival into this world! No matter how old she gets, she will always be my sweet little LacieBug! You can read all about her special day by clicking here and if you really want to get sentimental, you can take a look back over the last three years by clicking here! Stopping by from Friday Favorites...I am always looking for a new eye cream and will have to check out Clinique! Those halloween pj's are super cute! And definitely try the eye cream! You won't regret it! Definitely try the eye cream! It is the first one that I have truly loved in my decade plus of using them! Thanks for stopping by!